We recently met with a patient for her 1-week post op after placement of quadriceps implants. Her pain is minimal, the incisions are healing well, and the drains were detached as there was minimal output from them. The patient was so happy with the volume addition that she was tearful! To date, we have done a quadriceps implant for the upper portion of the thigh to improve volume loss due to HAART therapy and HIV. 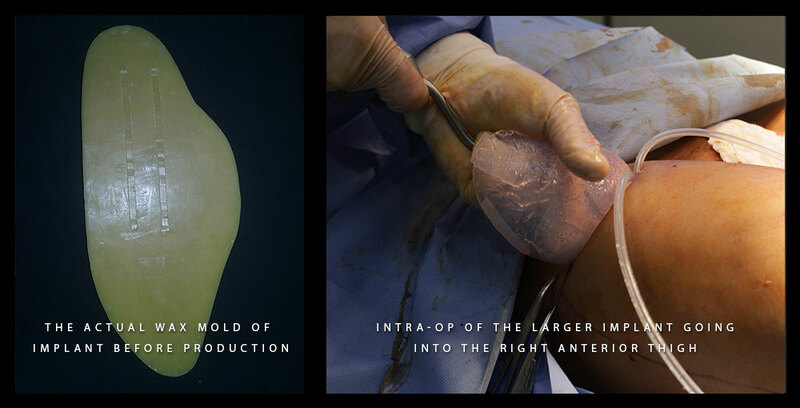 However, we have successfully completed the first ever quadriceps implant for improvement in volume of the anterior thigh. We made two implants. One to add volume to the areas of the vastus lateralis, vastus intermedius, and rectus femoris and a second, smaller implant to give volume to the vastus medialis. The quadriceps implant was designed and customized in conjunction with Justin Jedlica (http://justinjedlica.com/). Justin has been dubbed by the popular media as the “Human Ken Doll,” as he has been a proponent of body modification through the use of silicone implants. As a former patient of Dr. Nikolas Chugay, Justin was consulted on the case of this quadriceps augmentation to help the patient achieve a more bulky anterior thigh, something she had desired for years but was not able to achieve with conventional exercise and body building. Using the patient’s description of what she wanted along with an understanding of the leg anatomy, Justin and Dr. Paul Chugay worked to create an implant to meet the patient’s needs. After multiple edits to the implant, the final customized implants were created and the patient successfully underwent surgery to implant her new quadriceps implants!